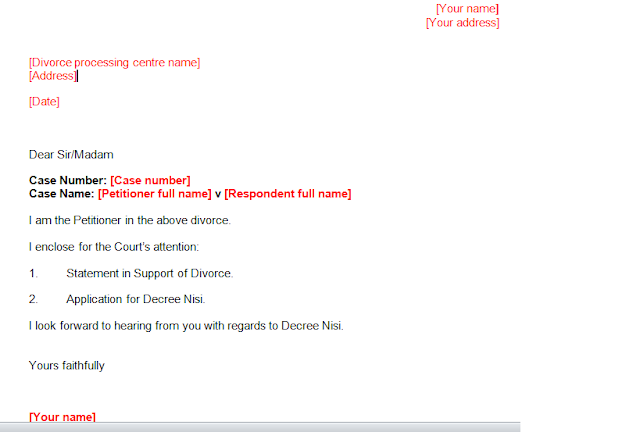 Once the Petitioner (whom I’m assuming is you) has sent the Divorce Petition (step-by-step advice on how to complete this is here) to the divorce processing centre (or occasionally Court), these are the remaining steps in the divorce process. 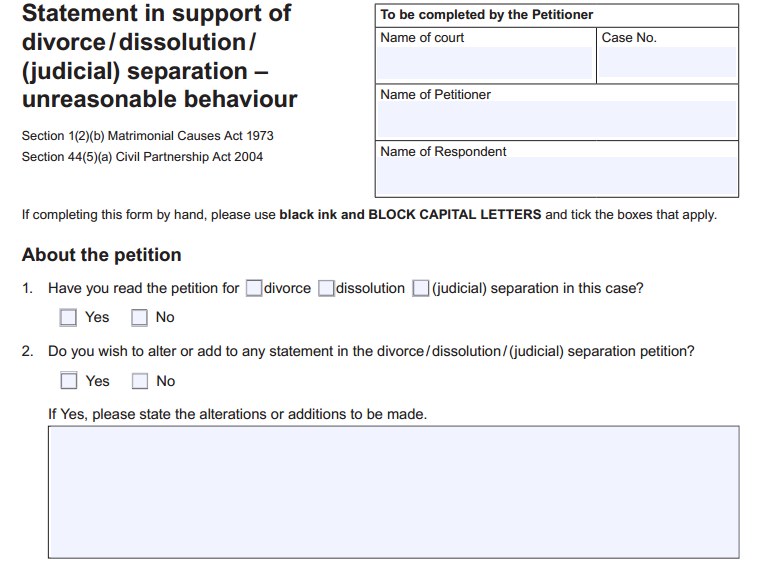 The divorce processing centre will send you a form called Notice of Issue of Petition (D9H), to tell you they have received your Divorce Petition. At the same time, they will send the Respondent, your ex-partner, a copy of the Divorce Petition, the Notice of Issue of Petition and the Acknowledgement of Service (D10) form. 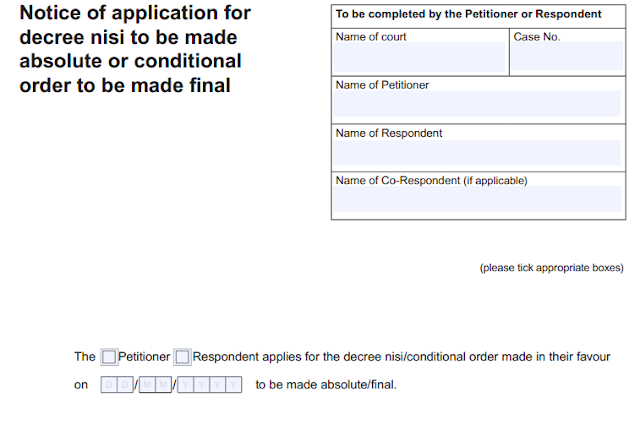 The Respondent will need to complete, sign and date the Acknowledgement of Service form and then return it to the centre. 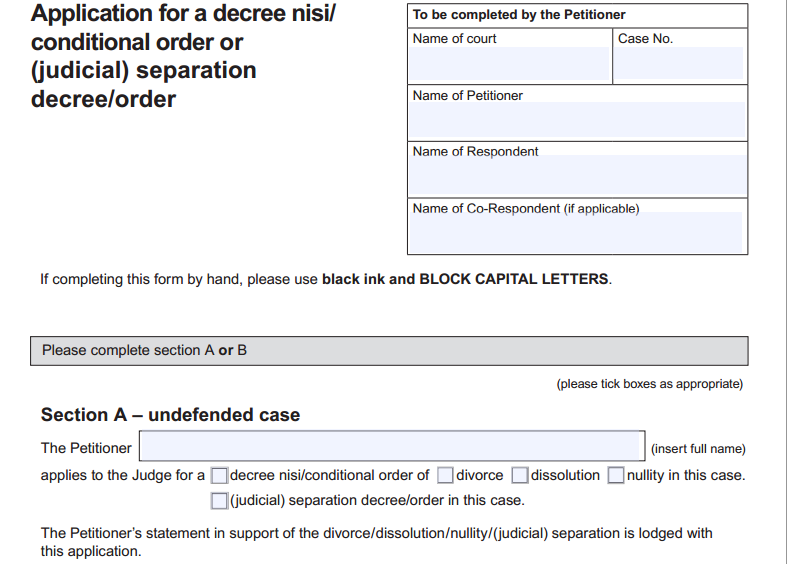 The centre will then send you, the Petitioner, a copy of the Acknowledgment of Service form, and the Statement in Support of Divorce (D80) and the Application for a Decree Nisi (D84) forms. 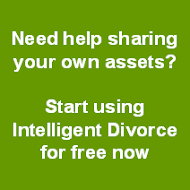 You now need to complete both the Statement in Support of Divorce (a pdf version you can complete on screen is available here - note you will have to enter 'D80' in the 'Form/leaflet no.' box and then choose the appropriate one depending on the grounds for divorce you chose in your Petition) and the Application for a Decree Nisi (D84) form (download a pdf version here). Note: in both forms, where it asks for the name of the court, in the top right box of page 1, copy what the divorce processing centre has put on one of the forms they have sent back to you. 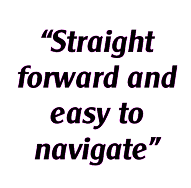 For example, if you live in the South East and have used the Bury St Edmunds divorce processing centre, you should enter 'Bury St Edmunds'. 2. 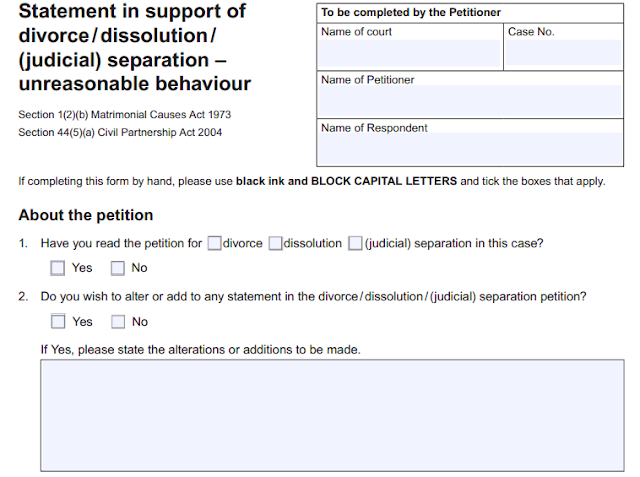 Sign the ‘Statement of truth’ section in the Statement in Support of Divorce and date it. 5. Download, complete and sign the template covering letter you’ll find here. 6. 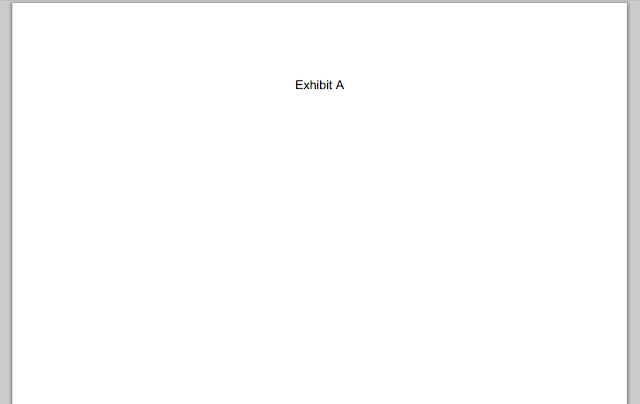 Return the stapled together forms with the covering letter to the centre. After a period you will each be sent a copy of the Certificate of Entitlement to Decree Nisi form - you will see it gives the date the Decree Nisi will be pronounced. You will be sent the Decree Nisi itself a week or so after it has been pronounced (sometimes this takes a bit longer). You can’t apply for the Decree Absolute until 6 weeks and 1 day after the grant of Decree Nisi. 2. 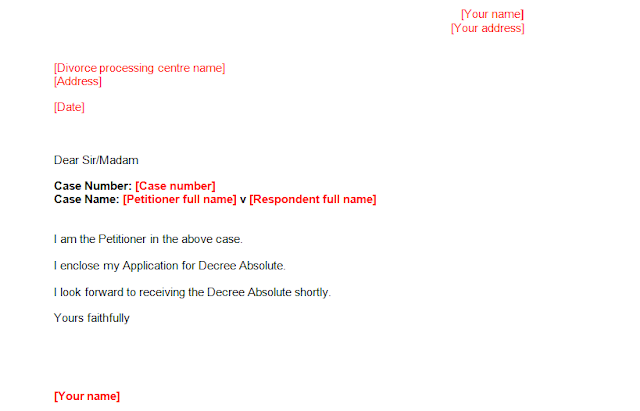 Download, complete and sign the template covering letter to the Court you’ll find here. 3. Send the form and the covering letter to the Court. You will usually be sent the Decree Absolute in about a week – this means that your divorce is now completed.